THE STORY - Thirty years after the defeat of the Galactic Empire, the galaxy faces a new threat from the evil Kylo Ren (Adam Driver) and the First Order. When a defector named Finn (John Boyega) crash-lands on a desert planet, he meets Rey (Daisy Ridley), a tough scavenger whose droid contains a top-secret map. Together, the young duo joins forces with Han Solo (Harrison Ford) to make sure the Resistance receives the intelligence concerning the whereabouts of Luke Skywalker (Mark Hamill), the last of the Jedi Knights. THE GOOD - The nostalgia is sincerely overwhelming in the best possible way. The new characters and how they interact with the old ones feels both authentic and creates a tremendous amount of excitement. Visually spellbinding. THE BAD - At times the story feels a little unfocused. It’s pacing becomes jumbled and not to mention, it’s basically a carbon copy of Episode IV. ​J.J. Abrams makes a triumphant returning entry to an already legendary Star Wars franchise with the seventh installment, "Star Wars Episode VII: The Force Awakens." Now while "The Force Awakens" is not above criticism by any means, however, the film instills in its audience some heartwarming nostalgia. Despite the film practically being a carbon copy of "Episode IV: A New Hope" it still tells an exciting story with some fresh new faces. With exciting new characters to add to the already star-studded roster, "The Force Awakens" is astute in its character development. "The Force Awakens" aims for the stars and despite some missteps along the way, it does manage to be a rather pleasing piece of the Star Wars franchise. Taking place three decades after the original trilogy, "The Force Awakens" revolves around a Stormtrooper named Finn (John Boyega) and a spare parts scavenger named Rey (Daisy Ridley). Even after the fall of the Empire, a new militia known as The First Order has arisen from the ashes of Emperor Palpatine and Darth Vader. The First Order is led by Supreme Leader Snoke (Andy Serkis) General Hux (Domnhall Gleeson) and a new Sith Lord, Kylo Ren (Adam Driver). Fighting against The First Order is a group of good Samaritans simply known as The Resistance. 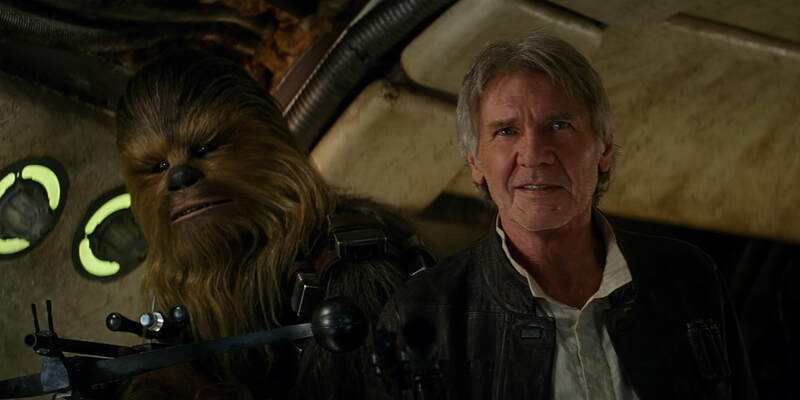 The Resistance consists of many friendly faces old and new but is mainly led by General Leia Organa (Carrie Fisher) and the space cowboy, Han Solo (Harrison Ford). Amidst the political turmoil and waging war between The First Order and The Resistance, there is one thing that everyone seems to be constantly searching for. With rumors of the Jedi being long extinct, there is a slight shred of evidence that the legendary Luke Skywalker (Mark Hamill) is still alive. The Resistance is on a quest to find Luke and utilize his knowledge to help bring down The First Order while The First Order is on a quest to find Luke, murder him and erase all evidence of the Jedi ever existing. Despite the fact that the film practically is a beat for beat remake of "A New Hope" it still is rather exciting to watch unfold. Everything from The Resistance searching for a missing piece to a map of Luke, to a giant "Death Star-esque" base that can obliterate entire planets with one blast of its laser, "The Force Awakens" really tries its absolute best to be unique, but does not succeed on the storytelling front. That being said it still is a ton of fun to watch and it truly is riveting to see "Star Wars" on the big screen once again. Granted, now we may be biting off more than we can chew with all of the upcoming side films, seeing Han Solo, Leia, and Luke on the big screen again brings tears to our nerdy little eyes. Sometimes nostalgia can be powerful enough to overthrow some poor storytelling choices but that does not mean its criticisms are unwarranted. The film does take a significant amount of time to get the story going, making the pacing feel a tad bit unfocused. Even once the story takes stride there are some moments within the second and third acts that just feel completely pointless. We drag through some just ridiculous character decisions and subplot points that do not necessarily bog down the film until the rewatches. And I mean c'mon, it's a "Star Wars" movie. Of course, there will be a thousand rewatches. Even though the pacing of the film feels a little off at times, the nostalgia and excitement factor do manage to overthrow those initial feelings. I mean, how can you not get excited watching Han Solo operate the Millenium Falcon again or hearing Chewbacca's roar? "The Force Awakens" is a visual marvel and quite possibly the best looking J.J. Abrams film (And "Star Wars" film) to date. Reeling in his fetish for lens flares (Despite a few notable ones here and there) he really focuses on the grand scope that is "Star Wars." With long sweeping dolly shots or dramatic slow push-ins or outs, Abrams and cinematographer Dan Mindel really have a grasp on the scope of the film. Aside from the cinematography, the costumes and production design are equally just as marvelous. The massive set pieces that include Starkiller Base itself, to Maz Kantana's cantina, the film relishes in its production design. And how can we not mention the returning legend known as John Williams, composing yet another score and giving us more memorable themes for this franchise? While the film is visually striking the real thing that carries a majority of the weight are the characters. The ensemble is absolutely glorious with the number of names on its roster. From old school champions like Harrison Ford, Hamill, and Fisher to each member of the new wave including Daisy Ridley, Jon Boyega, Oscar Isaac, Adam Driver, Domnhall Gleeson, Lupita Nyong'o, the list goes on for days. The interactions between characters feels so natural it kind of gives off the vibe of improvisation. Each moment of dialogue shared between characters is so nuanced, heartwarming and often very humorous. Whether it be the moments of romance shared between Leia and Solo or the relationship between Poe and Finn, the film is commanding in its use of characters. The film also expertly sets up the characters of Kylo Ren and Rey, giving them enough pathos, gravitas, and mystery that it perfectly sets up for their characters to be explored and pushed to their limits further in the next two film in this new trilogy. "The Force Awakens" is not a perfect film by any means but it definitely is an exciting one. Resurrecting the franchise, J.J. Abrams does a near-perfect job with his character development and execution of the set-pieces. In fact, he does such a great job in re-igniting why so many fans fell in love with "Star Wars" in the first place that is "almost" erases the stain that the horrible prequels left all over this franchise. While the film succeeds visually, it does tend to fall short with its storytelling by rehashing old storylines and simply putting them with these new characters. The nostalgia factor is definitely powerful enough to overthrow some of the slower and unfocused scenes of the film, but upon revisits of the film, there may be some disappointment that washes over. All in all "The Force Awakens" is an easily digestible way to bring back "Star Wars" with its ravishing characters and impressive visual approach, leaving us clamoring for what is to come with "The Last Jedi."